Literary Classics: Dr. Nicole's Are You Eating My Lunch? earns the Literary Classics Seal of Approval. Dr. Nicole's Are You Eating My Lunch? earns the Literary Classics Seal of Approval. 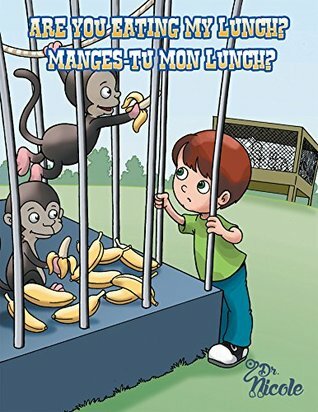 When Xavier visits the zoo he is in for a big surprise when he realizes his lunch has gone missing. So he asks the snake, "Are you eating my lunch?" to which the snake replies "No, I am eating my eggs, go ask the goat." So Xavier asks the goat. Each time he asks one of the zoo animals about his lunch, he is sent away to inquire of another animal. This book, with expressive and whimsical illustrations, is penned in English first, followed in French. This format provides children with excellent tools to learn another language through powerful visuals and repetition. Are You Eating My Lunch, is a wonderful educational picture book and is sure to be enjoyed by adults and children alike. Recommended for home and school libraries, Are You Eating My Lunch? has earned the Literary Classics Seal of Approval.